SF Taxi Media: SFMTA Seeks To Hire Consultants For Two-Year Taxi Study. By John Han. SFMTA Seeks To Hire Consultants For Two-Year Taxi Study. By John Han. 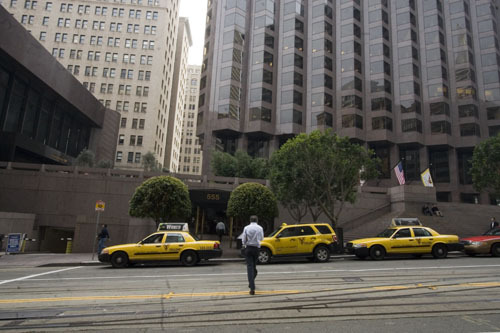 The San Francisco Municipal Transportation Agency, (SFMTA), put out a ‘Requests For Proposals’ (RFP) calling for consulting firms to bid on a two-year taxi study, that the agency hopes will answer some of the industry’s most daunting issues. Surveying the public rider-ship (listed as top priority) and then interviewing industry stakeholders. Researching the taxi industry’s national and international best practices. Developing a method to determine the public demand for taxi service and if there’s enough cabs to meet that demand, or if there needs to be more taxis. Developing a method to help the SFMTA analyze taximeter rates, and determine if meter rates need to be adjusted. Developing a method to help the SFMTA to analyze gate fees, and determine whether gate fees need to be adjusted. Helping the SFMTA develop performance standards in the field of taxi regulation. Recommending taxi regulation reforms in a number of key subject areas. You can view the RFP by CLICKING HERE. The study includes looking into the distribution of cabs, which can mean that it includes looking into the dispatching systems, and what technologies would be available to improve it. According to the RFP, contract negotiations are scheduled this month. The SFMTA may, according to the RFP, choose to reject all bids and not hire any consultants, or can start the bidding process over again. Otherwise, if the SFMTA selects a consultant this go round, the contract would be scheduled to begin October 1, 2011. A list of representative who recently attended a bidders’ conference includes Hara Associates, Transport Research Institute, University of Missouri, and Nelson/Nygaard Consulting Associates. Nelson/Nygaard is currently completing another study for the SFMTA regarding 5% credit card fees, rear seat payment terminals, and electronic waybills. The ‘Q and A’ publication is dated August 26, 2011 and can be viewed by CLICKING HERE. Taxi Industry Still The MTA’s Cash Cow? While the SFMTA has been racking up major points for the long anticipated business of BUSTING LIMOS (Ed Healy's coverage), it may not be a response to the outcries of taxi drivers only. The agency appears to be looking for revenue as a result of doing it. The SFMTA appears to be saying it wants to bust illegal taxis for two key reasons. To demonstrate that the outcries of SF taxi drivers are finally being listened to, and then respond with actions that could increase their business. To allow the above to justify issuing more new medallions, presumably to be sold as SFMTA direct sales to buyer at the price of $250,000 each. If these two items together were to become the City's approach, then the latter goal could nullify the former. In other words, the part where it says that, “… there would be more business for taxis…” may not necessarily come true. Busting illegal taxis means fewer numbers of vehicles for hire would be working the streets. Fewer vehicles on the streets means less competition for everyone. And less competition means better business. So if you remove illegal taxis from the streets and don't add new legal ones to make up the difference in numbers, then that would, in theory, boost the overall business for everyone. But if you remove illegal taxis and then say, “Now we can make up for the decline in numbers by issuing more REAL medallions”, then in theory, the number of vehicles for hire would stay at least the same or greater as before the illegal taxis were removed, and there’s no real reduction in competition. In that case, the taxi drivers businesses are not necessarily being boosted. The cab companies, since they would manage a greater number of medallions. The SFMTA because it mentions, "substantial revenue opportunity", implying that the method of issuing new medallions would most likely be direct SFMTA sales to buyer. The drivers who are at the top of the waiting list or those ready to purchase a medallion. But since the SFMTA implies sale of new medallions as the method of issuance, drivers most likely to benefit would be those ready to purchase medallions (directly from SFMTA), rather than those at the top of the waiting list through the traditional Prop K method. The implication here is that the SFMTA would hope to crack down on illegal cabs, replace the reduced numbers of vehicles on the street with new REAL medallions (through a medallion sales program), and then invest the revenue to expand taxi operations, that could include busting more illegal taxis and limos (and then sell more medallions?). Should The SFMTA Allow Some Illegal Taxis To Become Legal? While the SFMTA is certainly starting to crack down on illegal taxis thus drawing praise from the industry, at the same time, it has at least discussed the possibility of allowing some other out-of-town taxis to be legal. Here is another excerpt from the SFMTA’s ‘Q and A’. “Q: Have you discussed these issues with surrounding cities? The SFMTA should, and most likely will hold more public meetings such as town hall meetings, to discuss specific issues such as this. It is a very important issue, but there is possibly a better solution. As a former consultant @ Deloitte I know that these RFP's are more often then not simply a vehicle used solely to validate and then implement a plan that has already been created. Consultants write their "findings and recommendations" so that the individual or department that hired them, and who's cost center is paying the bill, is delivered exactly what they request. The F&R's go through numerous review cycles where the client edits the document as they wish and points are rewritten so they say what is asked. The final product will in no way be the true facts and best possible solution for Taxi service in SF. Just a way to generate political power. 1) Centralized VOICE (for accountability) dispatch utilizing an experienced service such as Citywide. The issue in SF is not a lack of cabs. I only drive weekend nights and i'm empty often. No, it's matching the closest cab to the need for that cab. a) Cab drops in sunset, drives all way back empty while two or three customers sit waiting because they called different dispatch. Centralized dispatch makes all cabs accessible to all orders! 2) MTA should implement an automated flag request system where those trying to flag a cab can dial a 3 digit number (i.e., 555) which activates their GPS location on a cell phone based map located in each cab. Each "flag" would be a red dot on map nothing else. No human involved, just dial wait for computer to say thanks, hang up, computer places dot. Dot remains for say few minutes on slow nights and maybe 5 or 10 on busy nights. Again system can utilize the number of calls in to determine how busy it is. Or, Map dots could be discharged via touch on map by driver once they have the customer in cab. Drivers can reference the map, which only shows few blocks @ time, as they troll the city. Empty cab driving down Geary @ 20th ave the driver can see people on Clement & 16th, Anza & 18th, etc need service... two turns and connect! Bam, you implement those two solutions and I will betcha cab service will be significantly improved! For both customers and drivers! Nice post and pretty informative as well! Taxi study sounds quite interesting... I liked the Question-Answer segment. It's helpful indeed. If you need in case of crisis rental car available at any time to switch from airport to house or office, you can call our service to get immediate taxi as we are providing 24 hours on the web support.